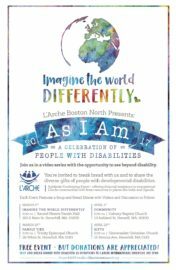 The L’Arche Boston North community in Haverhill, Massachusetts, is one of 150 L’Arche communities worldwide. Different languages, different cultures—all serving people with intellectual disabilities. From Ireland to Egypt, from Kenya to Ukraine, the same humanitarian endeavor launched by L’Arche founder Jean Vanier in 1964 has resulted in a common search for community. On four Saturday evenings between early March and mid-April, you are invited to view a series of short videos about people with disabilities living in some of these overseas communities. Hosted by members of the L’Arche Boston North community, each evening will include two videos, a light supper of soup and bread, and a discussion. The events are free, but voluntary donations are welcome. All donations will benefit the L’Arche International Financial Aid Fund—representing worldwide solidarity partners of L’Arche Boston North. This is a great chance to “imagine the world differently.” Please come and break bread with us!